Böcker, S, Klau, G.W, & Leong, H.W (Eds.). (2014). 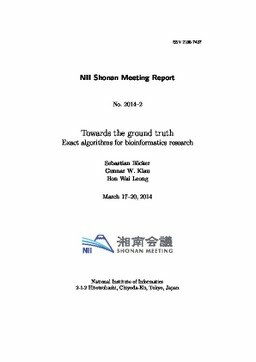 Towards the ground truth: Exact algorithms for bioinformatics research. In S Böcker, G.W Klau, & H.W Leong (Eds. ), Towards the ground truth: Exact algorithms for bioinformatics research. NII Shonan Meeting Report No. 2014-02.